Hair: Brown. It's basically very thick eyebrows that extend down the side of his face. He also has two ridges of brown hair going from his shoulders across his chest to come together in his groin. This is probably for decency's sake. Life history: Tyldak is a Glider and probably one of the weirdest looking elves ever. He originally looked normal, but he could only glide, while it was his dream to be able to really fly like a bird. He put this request to Winnowill, who eventually gave in and shaped his body the way it is now, drawing the wings from Tyldak's own flesh. This greatly indebted Tyldak to Winnowill, of course, so ever since then he was her servant, doing her every bidding. Tyldak's first meeting with the (to him) savage Wolfriders was a complete shock, because they were wild and wolf-blooded, but even more so because he Regocnized Dewshine, a creature whose impure blood and savage ways repelled him, just as she was repelled by his altered looks. The two of them fought it for as long as they could, until it was finally agreed that Dewshine would not stay and that Tyldak needn't be an active father, as Scouter promised to do this. Tyldak accompanied the Wolfriders and Lord Voll to the Frozen Mountains, but abandoned them there when Lord Voll died from a giant troll spear-arrow. He spent the next three years chained to the throne in Blue Mountain's throne room, because he had betrayed his Lord Winnowill. As, to Tyldak, flying equalled living and the other way around, this was the worst possible torture she could have thought of. When he saw Dewshine again, who had come to rescue her son Windkin (of whom Tyldak now also caught his first glimpse), he asked her to kill him if there was no hope left of defeating Winnowill, because he couldn't bear staying aground much longer. In the end it was Two-Edge who freed him, giving him Windkin so Tyldak could return him to Dewshine. Tyldak then proceeded to grab the half-healed and wrapped-up Winnowill, dumping her on a small island in the Vastdeep Water so she couldn't harm anyone anymore. Tyldak then disappeared for a while, reappearing again when Aroree and Kahvi attempted to cross the Vastdeep Water in search of the Wolfriders. He saved them in the nick of time, guiding them to an island nearby where they could rest. They eventually reached the Wolfriders and Tyldak stayed with them for a number of years, but eventually left again together with Kahvi, because neither of them felt they fitted into Wolfrider society. This started the lovemating between Tyldak and Kahvi. Tyldak truly loved Kahvi and would do anything for her, a feeling which was only partly returned. Kahvi saw him as pleasant company (especially in the furs), but although she did care for him, she never truly loved him. This didn't put Tyldak off, and he went with her wherever she went, helping her in any way she wanted. In this way he helped her prepare her attack on Sorrow's End to steal the Little Palace, rescuing her when she was plummeting to her death when Chot betrayed her and threw her off the giant hawk she was flying. He did prevent her from attacking Savah, however, stopping her to protect her from herself and letting them both be put in wrapstuff to cool off. The two of them were woken up again during the volcanic eruption and the second Go-Back attack that threatened the Sun Village. Yun cut open the wrapstuff, hoping that Kahvi would help with the panicking Sun Folk. Kahvi chose to try and steal the Little Palace again instead, but gave up on her claims after seeing the carnage of the attack, after which she and Tyldak returned to the Go-Backs to search for another trophy. Kahvi found it in the Egg of Six Spheres, created by Egg (or Aurek, as he was now called), but this was too much for Tyldak and he refused to help her this time. Kahvi then stole it on her own, but Tyldak still disagreed and followed her to retreive it, causing her to turn on him and wound him, after which he gave up and kept an eye on her from afar. 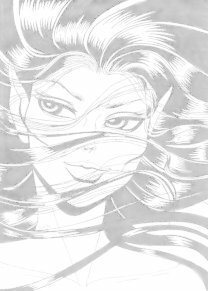 When Kahvi was finished and had finally discovered that she didn't need a trophy to stand out, she and Tyldak reunited, and the pair are now being sought by Venka, Aroree and the remaining Go-Backs.